I am now the proud owner of a 2005 PT Cruiser GT Convertible. 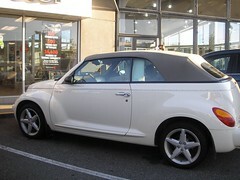 A convertible in Vancouver!? I hear you ask... well, you may be right - but I couldn't resist. While it's "new" - it was actually used. 9K kilometers on the odometer means someone else ate the depreciation, but I got a new car. Fully loaded - leather interior, sound system, power everything. 5 Speed, 220 HP Turbo charged motor. Of course, the trip to Autoplan nearly killed me, but that's another story. Yay! You deserve it sweetie! not so yay for almost dying. what are you going to do with your import now? I fear for your sanity.